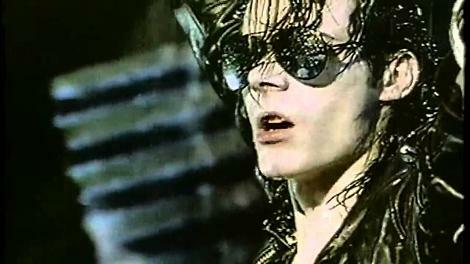 "This Corrosion" was the first and biggest hit single for gothic rock band The Sisters of Mercy, and was released as the lead single from their second studio album Floodland, several weeks before the album's release on Nov 13th 1987. The single entered the UK singles chart at No.13 on the 27th Sept, making it the highest new entry that week. It peaked at No.7 for one week on 4th October, while M/A/R/R/S were at No.1 with "Pump Up the Volume". The dramatic and inflated production was created by the legendary Jim Steinman, who also worked with Bonnie Tyler and Meat Loaf. It's a style of 80s production that I actually adore, and it's definitely more preferable to the modern tinpot production techniques which are far too minimalist for my liking. "This Corrosion" was written by the band's frontman Andrew Eldritch, who is the only remaining original member in the current line-up. The song features the 40-piece choir, New York Choral Society. The CD and cassette album versions last for 10 minutes 55 seconds. The vinyl LP version is shorter at 9:16, and this album format included only 8 tracks, whereas the CD album featured 10 tracks (with "Torch" and "Colours" as the extra tracks) and the cassette album featured 9 tracks ("Colours" was not included). "Torch" and "Colours" were also included on the 12 inch and CD singles, although varied in length on each format. "Torch" featured as the B-side to the 7 inch vinyl single. A different version of "This Corrosion" was included on each format release, the longest (11:21) being on the CD single. The lyrics are a dig at former members of the band Craig Adams (bassist) and Wayne Hussey (guitarist) who left to form The Sisterhood, which eventually became The Mission. They parody Wayne Hussey's lyrical style in The Mission, which Eldritch described as being "a string of cliches". Floodland saw a departure of the guitar rock style to a more synth-based, Wagnerian rock style, a term created by Jim Steinman for music which combines 20th century rock with 19th century opera, as on Meatloaf's Bat Out of Hell albums. Simon Pegg was a fan of the band during his youth, and "This Corrosion" partly inspired the 2013 zombie comedy horror The World's End, with the song featuring in the film and on The World's End soundtrack album. Two further singles from Floodland were also top 20 hits on the UK. "Dominion" reached No.12 and "Lucreatia My Reflection" reached No.20.